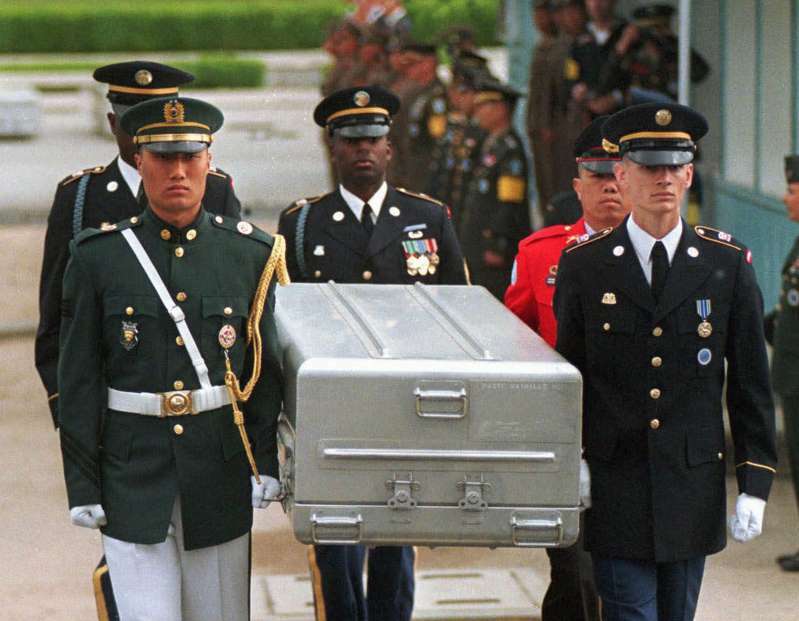 FILE- In this May 14, 1999, file photo, U.N. honor guards carry a coffin containing the remains of the American soldiers after it was returned from North Korea at the border village of Panmunjom, South Korea. South Korean media reported that the U.S. military plans to send 215 caskets to North Korea through a border village on Saturday, June 23, 2018, so that the North could begin the process of returning the remains of U.S. soldiers who have been missing since the 1950-53 Korean War. U.S. and North Korean officials are expected to meet Sunday to discuss returning the remains of American soldiers killed almost seven decades ago, a possible chance to ease tensions between the two sides they as argue over disarmament issues. [post_ads]The negotiations are the first working-level talks since Secretary of State Michael Pompeo’s visit to Pyongyang ended earlier this month with North Korea denouncing the U.S.’s “unilateral and gangster-like demand for denuclearization.” The meeting was initially planned for Thursday, but was rescheduled after the North Koreans failed to show. The U.S. Department of Defense estimates that North Korea is holding about 200 sets of remains from the some 5,300 American military personnel believed missing in the country and their recovery has long been among the most emotionally charged issues between the two sides. Caskets that the U.S. shipped to the border last month haven’t been filled, despite Kim Jong Un’s pledge during his June 12 summit with President Donald Trump to immediately repatriate identified remains. While recovering the war dead would provide Trump a political victory similar to Kim’s May release of three living American detainees, it would do little to advance the goal of dismantling the regime’s weapons program. The U.S. also risks giving the North Koreans leverage to continue diplomacy and drag out disarmament talks. The divergence in public comments fueled further doubts about whether Trump will ever achieve his goal of “complete denuclearization,” much less on the timeline of one to 2-1/2 years set out by various administration officials. Nevertheless, Trump on Thursday praised Kim, saying that “great progress” was being made in negotiations. In a Twitter post, Trump attached copies of a July 6 letter from Kim lauding the U.S. leader’s “energetic and extraordinary efforts” and expressing “invariable trust and confidence” in his ability to advance talks. The letter’s date suggested it was written before Pompeo’s latest visit. After the North Koreans failed to show up Thursday for the talks on war remains, which are being led by military officials, South Korea’s Yonhap News Agency reported that the North Koreans had called United Nations Command via a hotline that hasn’t been used for five years and said they were unprepared to take part. The country proposed holding a higher-level meeting than the working-level talks originally announced by Pompeo, Yonhap said, citing a diplomatic official it didn’t identify. Trump has expressed an eagerness to tout the war dead’s recovery, telling Fox News that Kim was “giving us back the remains of probably 7,500 soldiers” and then, to supporters in Nevada, that North Korea had already handed over 200 sets of remains. Pompeo was obliged to correct those claims, telling a U.S. Senate committee June 27 that no exchanges have been made. Efforts to recover the missing war dead date back to before the two sides formally stopped fighting. Joint efforts to find and identify U.S. personnel between 1990 and 2005 recovered more than 300 sets of remains and were suspended as nuclear talks between the two sides deteriorated. North Korea last repatriated the remains of six individuals in 2007. Obama administration attempts to restart discussions foundered as Kim accelerated his nuclear program. In 2014, the state-run Korean Central News Agency published a statement blaming the U.S.’s “hostile policy” for ending the recovery missions and warning that the bodies of American soldiers were being “carried away en-masse” to make way for infrastructure improvements. --With assistance from Heejin Kim.